WASHINGTON, Dec 10 2013 (IPS) - Internal government documents leaked Monday offer a sombre picture of ongoing negotiations towards a major free-trade area covering much of the Pacific Rim. The area is a key objective for the administration of President Barack Obama but has been harshly criticised by a broad spectrum of global civil society. While U.S. trade officials have insisted on December as a deadline for agreement on the 12-member Trans-Pacific Partnership (TPP), a new briefing written by one of those 12 governments suggests that negotiators remain far apart on several notable policy areas. The picture that emerges is one of an intransigent U.S. Trade Representative (USTR) being increasingly isolated in the negotiations. “[T]he U.S. is exerting great pressure to close as many issues as possible … However the Chapters that were reviewed by the [chief negotiators] did not record much progress,” the memo, reportedly written within the past two weeks by one of the governments party to the TPP negotiations and published on Monday by WikiLeaks, stated. "It’s clear who’s behind the U.S. agenda: large corporate interests." 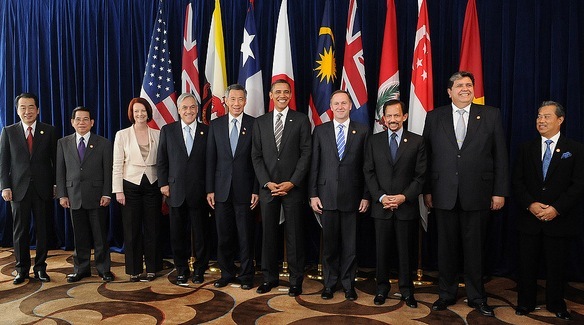 TPP negotiators are currently in Singapore for what has been widely seen as a closing round of talks towards the TPP, which has been seriously debated for almost four years. The narrative of looming success received additional momentum following Saturday’s small but significant agreement under the World Trade Organisation (WTO), the global body’s first accord since its creation in 1995. Following that success, seen as an important fillip for multilateral trade mechanisms, ministers from the TPP countries flew straight to Singapore, where they’re holding talks through Tuesday. “The latest leaks reveal the USTR continues to bully Asian countries into accepting some of the worst corporate expansions in any international agreement,” Arthur Stamoulis, executive director of the Citizens Trade Campaign, an advocacy group here, told IPS. Either way, the document’s substance depicts a pessimistic narrative and calls the possibility of meeting an end-December deadline “very difficult” to imagine. The TPP negotiations process has been pilloried by civil society due to its secrecy, with much of the public’s knowledge of the substance of the talks coming from leaks such as Monday’s. But supporters and opponents alike agree that the stakes are high. If eventually signed, the TPP would provide a blueprint for U.S. trade arrangements for the foreseeable future, and as an open-ended agreement, it could also expand as required. Still, the new leaked memo outlines dozens of outstanding disagreements, many substantive and most involving the United States, in at least 15 broad chapters. On several important issues, such as environmental and labour safeguards, it appears that the discussion has barely even begun. One of the most controversial issues appears to be a strong push by the United States to require the creation of an independent mediation mechanism for disputes between investors and states. Such “investor-state tribunals” have been a regular part of bilateral U.S. trade deals since the 1990s, particularly in Latin America, and allow foreign investors to sue governments outside of the national legal system for policies seen as impinging on profits. Still, it is unclear whether deadlock over the investor-state tribunal issue could actually scupper the broader TPP talks in which the Obama administration is deeply invested.